This article is by guest author RedFoxFence.com. Used with permission. 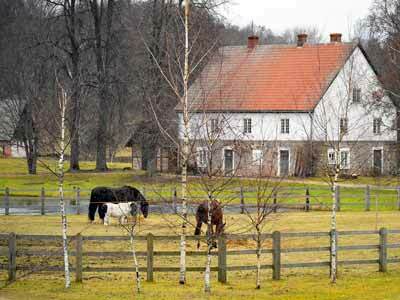 What Are Some Horse Fence Basics? This is the classic horse fence, with wooden boards and wooden posts. If you go to a ranch or a farm, chances are that you’ll spot these somewhere in the area. They are simple, cheap, and you can install them by yourself. This type of fence is strong and will be a good barrier for keeping horses in place. It’s a good traditional choice for many barns and will add value to any home. Below: A beautiful, classic, wooden fence. This no-climb fencing features gridded woven wiring with wooden posts. It will create a barrier around your property while maintaining that clean and classic look. 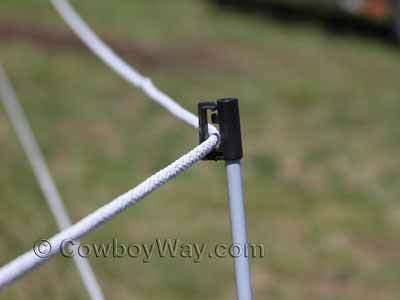 These will function as a solid barrier between your area and your horse's area. Other animals, like coyotes, will not be able to access your pasture. This is a great option for horses since it has a tight weave to keep them in while leaving other animals out. The weave is also small enough to keep your horses from getting caught in it. Woven fences will work as a good barrier, while still allowing air circulation into your pasture. It also looks rustic and will add some style to your corral, impressing anyone that happens to pass by your property. This is a great fence to have if you are having issues with coyotes or other animals coming in and around your property. This fence is made up of poly fibers with metal strands woven into it to conduct electricity. Electric tape is tightly strung and will look nice and clean as a fence. You can choose from various widths, depending on your preferences and how much visibility you want. The electric tape will be easier to see than electric wiring, which is ideal when containing horses. It will not rust and is easy to assemble. You can also choose between various color options to add a little bit of style to your fencing. The only downside is that if you live in a windy area, the thicker tapes may suffer some damage. If you are having this problem, try using an electric braid instead. This fencing option will have metal conductors to transmit electricity throughout the circumference of the area. There are a variety of diameters to choose from, and all will still allow visibility, regardless of your choice. Electric braids will give your barrier a clean look. This option is also available in multiple colors to add a little more to the appearance and to your property. The metal conductors in these electric braids will conduct electricity so efficiently that power will be distributed evenly. This is a great way to make sure that no power goes to waste and that your fence will operate without any major issues. These are also more reliable if you live in a windy climate. These conductors will stay put and won't become damaged as easily as electric tape. Below: A white, electric braid fence. Colored electric braid fences are also popular. This article was contributed by guest author RedFoxFence.com and is being used with permission. Established in 2006, Red Fox Fence is a full-service fence installation company. They specialize in many different types of fencing as well as entrance gates, decorative landscape structures, decks, new and enclosed gardens, as well as railroad tie walkways and walls.